Run, run, as fast as you can...The GINGERDEAD MAN is back for more! struggling to keep the place from closing down for good. Desperate for another hit movie, he quickly puts several outrageous genre films into production, including SPACE SPANKERS 2015, HAMBURGER TIME TRAVELER DETECTIVE and a sequel to one of his father s infamous and once popular film franchises TINY TERRORS 9: PURGATORY OF THE PETITE. Little does he know that Cheatam Studios is about to get more action than he ever imagined as the deranged cookie murderer known as THE GINGERDEAD MAN is about to crash the studio lot and leave behind a trail of bloody murder and hilarious mayhem. 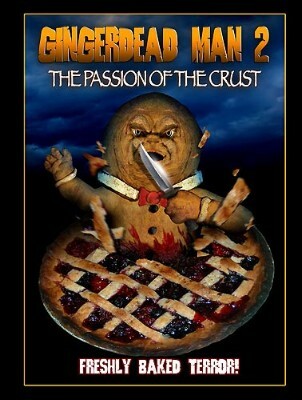 "The Gingerdead Man 2: Passion of the Crust", is a non-stop, hilarious and horrifying journey as the worst of bad yeast rises again! Terror has never tasted so good!